Posted on July 31, 2014 by Tiffany F.
Congratulations to SUMMER on winning a Happy Family giveaway pack! Thank you to everyone who participating in this awesome giveaway and also to Happy Family for making it such a huge success! I had so much fun, so let’s do it again sometime soon, okay? Posted on July 14, 2014 by Tiffany F.
It’s been a long time since I updated you on our happenings on the family front, but can you guys believe that our baby girl is NINE freakin’ months old? When did that happen?! Over the span of a week, she figured out how to sit up from lying down position and then how to pull herself up from sitting. Can I just say that it freaks me out just a bit (okay – maybe a lot) to see her lying down one second then she’s sitting or standing straight up talking to herself two seconds later, before I even have the chance to blink. I can barely handle how quickly she is growing! Zero to nine months.. Seriously?! Anyhooo.. like with most conversations I have these days, I digress! With growing up comes the territory of ever evolving eating habits, not just for Madison, but us also! Although we’ve tried for the last few years to eat well as much as we can, the biggest change we’ve implemented into our lifestyle is going organic. Many people see organic as the latest fad, but we feel informed and well-educated enough to know that this is the right decision for us as a family. Obviously it’s not possible to eat organic all day every day, but when we can, we do! We like to make Madison’s food from scratch, but sometimes things are just too busy that we need a more convenient option. We also like to give her diet a bit of variety, so that’s where Happy Family’s Happy Baby line comes to the rescue! You may remember me raving about their adult pouches many, many (pre-baby) months ago. Well, their line of baby nom noms have come in handy many a time over the last few months when we’ve realized Maddie’s freezer stash was gonezo or that she needed a little spice in her life. We love to mix things up by offering her a pouch of their Homestyle Meals or mixing one of their fruit & veggie medleys into a serving of her baby cereal. She’s currently obsessed with their brown rice pudding with banana, apple, and cinnamon – and who can blame her! How could we not be happy with such a great selection of yumminess! 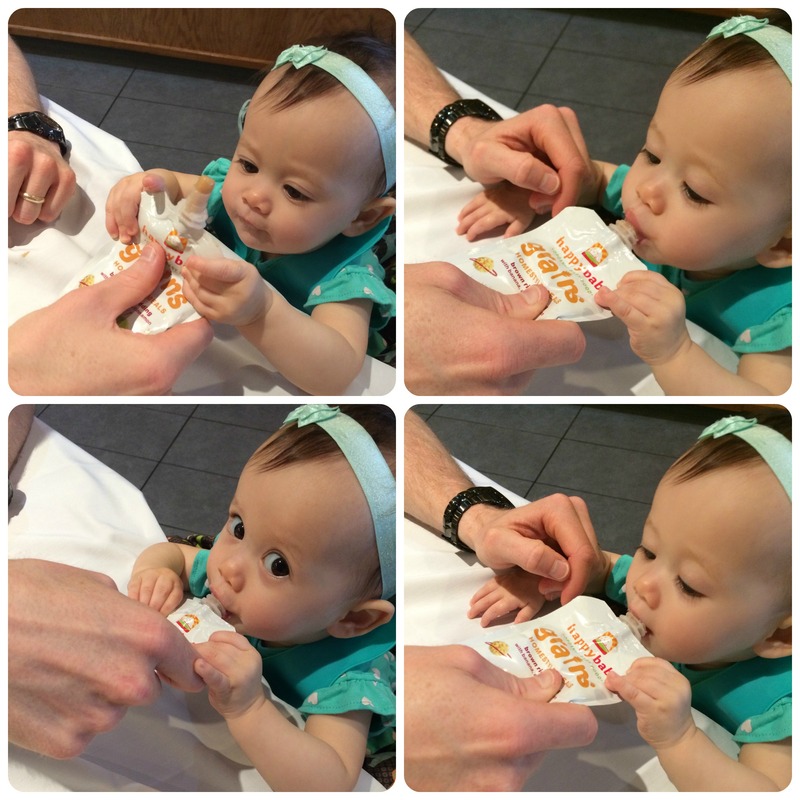 So what do we love most about the Happy Baby food pouches? We can literally just toss them in our diaper bag on the way out the door and know that we have a healthy option for the bub when we’re on the go. And let’s face it, that’s us pretty much every day,every week – but who isn’t as a parent, really? Step 1: Squeeze. Step 2: Slurp. Step 3: Slurp. Step 4: Slurp some more…. Whether your little person is just starting off on solids or isn’t such a little person anymore, they have something for every stage and every age. Don’t believe me? 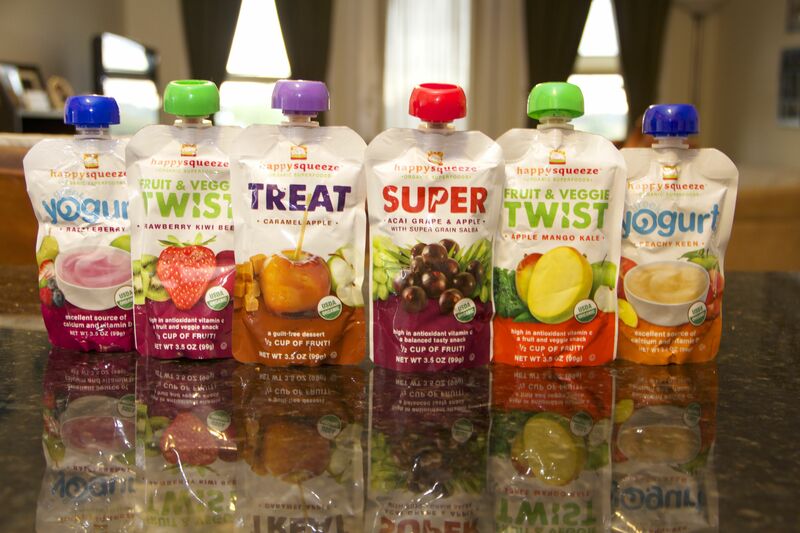 You can find out more about the Happy Family Organic Superfoods brand and all of their product lines on their website. 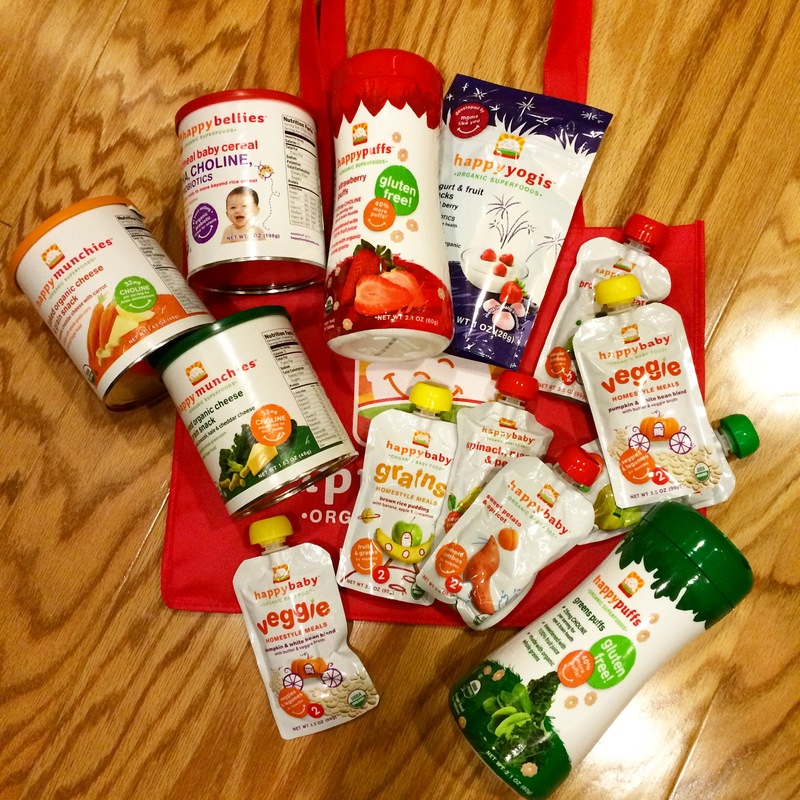 Enter for a chance to win a free Happiest Baby Giveaway pack! This giveaway will be open starting today July 14th and ends in two weeks on July 28th, so hurry and enter to win a nutritious and tasty pack of yumminess! Best of luck to everyone and Happy eating! Posted on December 3, 2013 by Tiffany F.
And we have a winner for our Happy Family giveaway! Drumroll, please…. A representative from Happy Family will be contacting you shortly. Thanks to everyone who participated and made this giveaway a huge success!